New Zealand's impressive ability to produce long-range tries from turnover ball and a "special" Beauden Barrett foursome floored Australia at Auckland's Eden Park on Saturday. 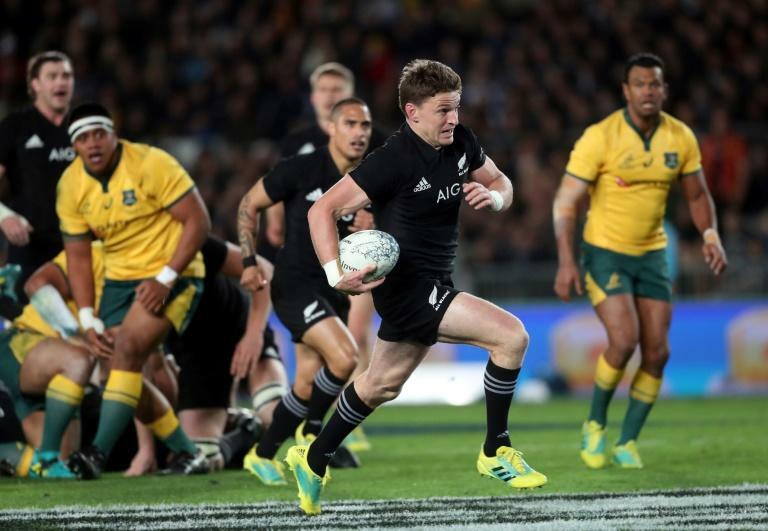 The match statistics said the two sides were even but the 40-12 scoreline proved otherwise as the All Blacks wrapped up the Bledisloe Cup for the 16th straight year and stayed on track to defend their Rugby Championship crown. Barrett was the chief architect as he either launched the counter-attacks or produced an uncanny ability to be on hand to finish them off. His four tries and five conversions gave him a match haul of 30 points, an individual New Zealand record against Australia. "We got killed on the turnovers. That pretty much sums up the tale," said Wallabies coach Michael Cheika. His side held the All Blacks to 7-7 until just before half-time, when the floodgates opened and in five minutes of play either side of the break the All Blacks produced tries to Barrett and Joe Moody. The score stretched to 21-7 and Australia were out of the contest. Overall, the All Blacks outscored the Wallabies six tries to two with four to Barrett and one each to Moody and Liam Squire, while Will Genia and Reece Hodge touched down for Australia. All Blacks coach Steve Hansen called Barrett "a special player". "He's been world player of the year for the last two years... you can't buy experience and you can't buy moments in the middle and Beauden's had those and we saw tonight what happens when they all click together." But the All Blacks razzle-dazzle performance, which left the Wallabies chasing shadows, was not something that can be taught, according to backs coach Ian Foster. "They're making up some of that stuff by themselves," he said. "It's just a great hunger with the team. The mindset to go out and attack means any scraps we got we were able to switch pretty quickly into an attacking mode. Then it's a matter of not getting too structured with it." Wallabies captain Michael Hooper conceded his side had no answer. "It happened very fast. Our ability to get on the same page is the issue," he said. "They're doing it better than us. When we turned over the ball, and we turned over plenty of their ball tonight, we weren't able to capitalise." Cheika was more blunt and blamed poor decision-making by his side as they chose to drive through the middle with turnover ball rather than go wide and stretch the All Blacks defence. 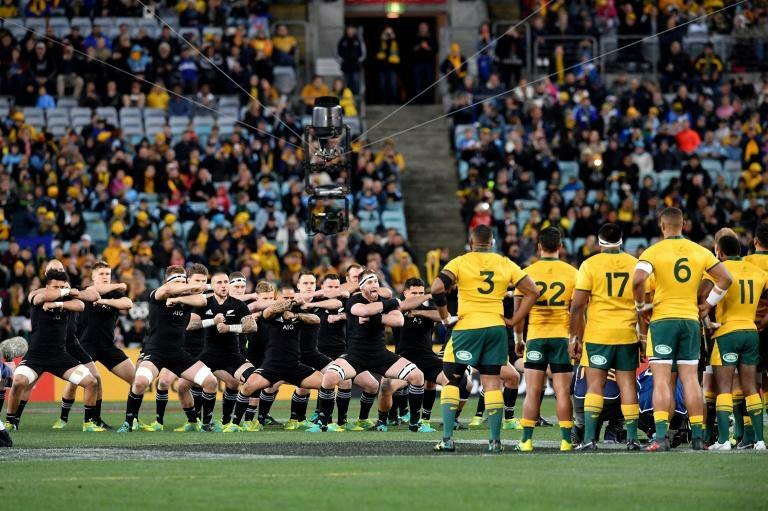 The Wallabies have now lost 22 matches in a row since 2001 in New Zealand and have not won at Eden Park since 1986. Hansen had warned in the lead-up to the Test that the biggest problem facing his world-champion side was the mindset to back up from last week's blowout 38-13 win in Sydney. But that did not appear an issue in a high-octane performance where they ran at every opportunity. Their two first-half tries were both counter-attack moves from around their own 22-metre mark. Ben Smith won the aerial battle from an Aaron Smith box kick to launch a run that led to Barrett's first try. Smith was again in the action just before half-time, working with Codie Taylor down the right flank before Barrett finished the move with his second try. The black mark for the All Blacks was their scrum, which did not function as well as they would have wanted with tighthead prop Owen Franks celebrating his milestone 100th Test. But the All Blacks again had the better of the lineouts which satisfied Hansen. "We scored six tries, three of those were off the lineout, so that was an area we wanted to get better at and we got the rewards," he said.